Need to extend the capabilities of your iPhone? Grab an accessory. Add-ons like battery packs, camera lenses, and speakers all promise to make the iPhone an even more central part of many aspects of your life—and they succeed. The experience with many, however, has been a little clunky. 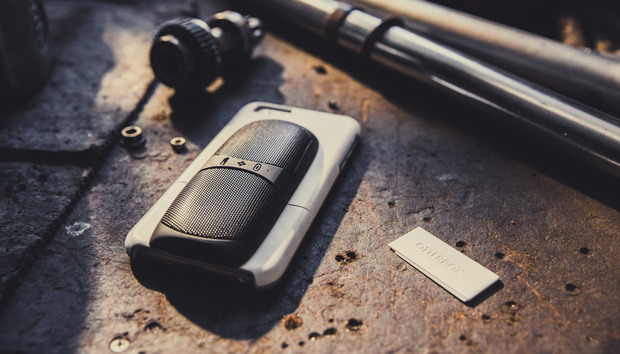 Rugged mobile case manufacturer OtterBox thinks it’s solved this problem with a rather clever system of add-ons to its new Universe Case System. This system consists of various accessory modulars that you can attach to your iPhone via its protective case. I took several modules out for a test run to try out the experience with my iPhone 6s, but there are plenty more than what I mention here—OtterBox has partnered with other companies and now offers everything from a Square payments reader to the Influx Wi-Fi booster. The effort by OtterBox is one of the most comprehensive initiatives to try and make finding and attaching modules to your iPhone a seamless process. You can check the full list of products if you want a peek at what’s to come. When you think OtterBox, you usually envision a small tank that turns your iPhone into an unwieldy beast. Not so with the Universe Case ($49.95 to $59.95 MSRP, $44.95 on Amazon), which is similar to the more slimmed-down Commuter Series that has been popular for the iPhone and various other smartphones. The Universe Case comes in white (called Snowcapped) or black, which should pair nicely with the accompanying color of your iPhone 6/6s or 6/6s Plus. This isn’t your father’s Otterbox case that was built to be worn on a belt clip. The back features a removable slot for all of the supported modules to slide into. It’s a little tough to remove, requiring a firm pull to get the slot off. But the case is extremely durable, easy to grip, and in the great OtterBox tradition able to withstand drops or tosses from a toddler. To use the modules, you slide them into the slot on the back. They stay on firmly, requiring quite the tug to remove them. But rest assured, nothing will separate them from the case throughout your day, no matter which one you’ve decided to slap in there. This $50 add-on was my favorite. It snaps onto the back of the case and supplies much-needed replenishment to your iPhone. I found it took me from 20 percent to 83 percent with a full battery charge. Results varied under different circumstances, but in all it’s a pretty reliable way to bring your iPhone back to life if it’s teetering on the edge. The battery pack module isn’t too bulky, and it’s nowhere near as ugly as Apple’s battery pack. To recharge, just plug the micro-USB cord into the device and then plug it into another USB slot. It’s extremely handy to have around, and is far less burdensome than the ugly Apple battery case. Sufficient storage on your iPhone can be a never-ending battle, particularly if you like to take a lot of live photos and video. This module ($60 MSRP for 64GB of capacity or $120 MSRP for 128GB) takes a little more legwork, but the Sandisk add-on is a handy way to get some more storage space. Need extra storage? The Sandisk module is happy to assist. You’ll need the accompanying iPhone app to put it to use. Once installed, you’ll find a lot of options inside, like the ability to sync your Camera Roll, transfer videos, or make other storage moves that could free up space. Personally I find cloud services to be more convenient, but if you’re frequently somewhere without reliable Internet access this could be a good solution. You knew there was going to be something that looked like the dreaded selfie stick. But this module ($50 MSRP) is actually a great way to take stable pictures if you’re doing some landscape photography or just want photos that don’t have the shakes. And yes, it also works well as a selfie stick. While I generally have a self-imposed ban on the use of some type of device to assist with selfies, it could certainly be handy in these situations. If you need some stable selfies or panoramic shots, the Trippler tripod is a great add-on. Getting the phone screwed in to the top of the tripod isn’t a lighting-fast process, but once it’s in there you don’t have to worry that it will somehow become detached. Feel free to lug it along if you’re off into the wilderness. This was a close second for me in terms of my favorite modules. The Nite Ize Steelie Vent Mount Kit ($40 MSRP) takes a little longer to set up than some of the others, as there’s a module and a magnetic socket that you need to connect. The car mount slips right into the case, which means no fumbling with awkward clips or taking your iPhone out of a case. But once you do this, you have a a very durable car mount that attaches to the ventilators. Whether you’re getting your Uber on or just want to have a map right in front of you for the next road trip, this module is easy to recommend. The iPhone is already one of the best smartphone cameras you can get, but there are probably times you wish it could get do a little more. The Olloclip four-in-one lens ($80 MSRP) is one of the first add-on lenses that I’ve found to not be too oppressive, as it includes an easy-to-use clip for storage and a lanyard if you want to wear it around your neck while on the go. The Olloclip four-in-one slips right onto the Otterbox case. You get four different type of experiences from the lenses: fisheye, wide-angle, macro 10x, and macro 15x. Check out how the world looks from the inside of a fish bowl. My favorite was the fisheye bubble, because it gives a unique perspective and is something that could definitely boost up the number of likes you have on Facebook or Instagram when it comes time to sharing the latest family photo. For $60, you can add on a pretty solid set of speakers that also connect to your OtterBox case. The sound was rather impressive, and they’re small enough to not take up too much space in a purse or bag if you’re taking them somewhere. This set of speakers produces some impressive sounds for your next house party or work session. However, I preferred to use the speakers on the desk instead of attaching them, as it’s pretty awkward to use the phone with a pair of speakers coming out of the back. They illustrate, along with the other modules, how the iPhone is the central device for your life. Photography, music, and navigation all flow from this computer that can perform so many tricks. The price for all of these can definitely add up, but such add-ons are a smart way to make your iPhone even more useful.